Did you catch a glimpse of the May 21, 2012 TIME Magazine cover? It features a real mom from Los Angeles with her three-year-old son nursing while eyeing the camera with a toddler glare. The cover story for the issue asks “Are You Mom Enough?” and hones in on attachment parenting. This week, attachment parenting gets all the buzz. Next week, it will be breastfeeding vs. formula feeding. Inevitably, the co-sleeping, baby-wearing, organic mommas will look down their noses on those who put babies in cribs in their own rooms, push them in a stroller, and look the other way when their baby eats who knows what off the floor. And those mommas will in turn think (or perhaps say) something snarky about the crunchy granola mom with the kale in her cart. And then there’s the merry-go-round we all seem to love to ride—the working mom vs. stay-at-home mom debate. Moms in both camps feel the need to defend the arrangement their family has made in terms that sound absolute. The problem with the comparison game is that everyone loses. When moms constantly compare notes, the result is only guilt laced with unrealistic expectations. The mom who plays loses because she feels like she isn’t succeeding as a mom. Her kids lose because they are evaluated by someone else’s measuring stick. Your mothering instincts are real. You know when your baby is ready to move to his or her own room, stop nursing, or go to school. Someone else’s child may be on a completely different timetable, and that’s okay. Likewise, you know what you have the capacity to handle as a mother and which battles are worth fighting in your house. For example, I love to cook and I do my best to feed my children nutritiously, but occasionally they have pop tarts for breakfast and popcorn for dinner. I understand that nutrition is really important, and veggies are our friends, but eating organic is simply not my war. 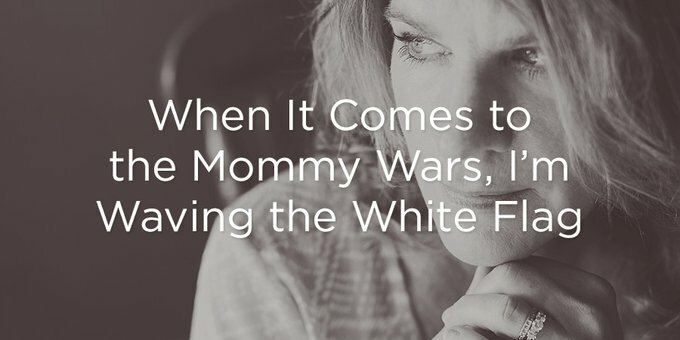 Let’s lay down our weapons, moms. Let’s stop looking over the fence and comparing notes every chance we get and work harder to stick together, because motherhood is tough. It is made tougher when we exhaust precious energy second-guessing every decision. It starts with you, mom. You can’t make another mom stop comparing or start doing things your way. But you can make the choice to put an end to the comparison game in your own heart and ask God to help you prioritize mothering as an alternative to following the crowd. Let me help you with a simple exercise. Leave a comment below listing what you do really well as a mother. What are your strengths? What do you do that helps your children thrive? Then make me a pinky promise. As you read other mothers’ comments, don’t think to yourself, I wish that was my strength. Instead, be thankful that you are created by a God with infinite abilities to equip you to mother. I know it is hard to stop playing the comparison game. But it’s time to lay comparison, guilt, shame, and doubt down and to mother our own the best we know how. We can trust God to take it from there.